Oh Friends!!! It is almost Easter!!! And we know that Easter is an extra special time for people who enjoy sewing!!! 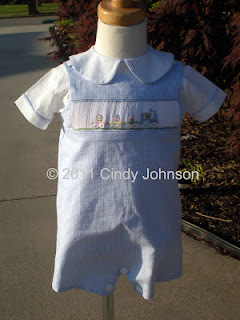 :) I have stitched a bunch of precious little Easter outfits over the years. 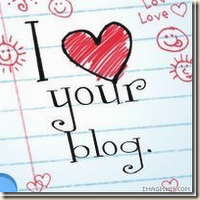 I thought I would show a few here and add a few links if you want to dig a bit deeper on this blog. First though, Easter is late this year! Do you know why? Do you know how it's determined when Easter is every year? I didn't know until about 15 years ago when I actually looked it up. Easter is the first Sunday, after the first Full Moon, after the Spring Equinox. Pretty cool!!! Ok....so above is one of my absolute favorite little boy Easter outfits!!! This was made with a Creations by Michie pattern #102. Here is the link to the blog post about it. 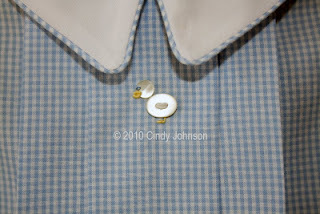 And here is a close-up of the adorable little chick made with the mother of pearl buttons. So cute!!! This was a super fun dress to make. And I really liked working with the rick rack to create the flower. You can read all about it here and here. 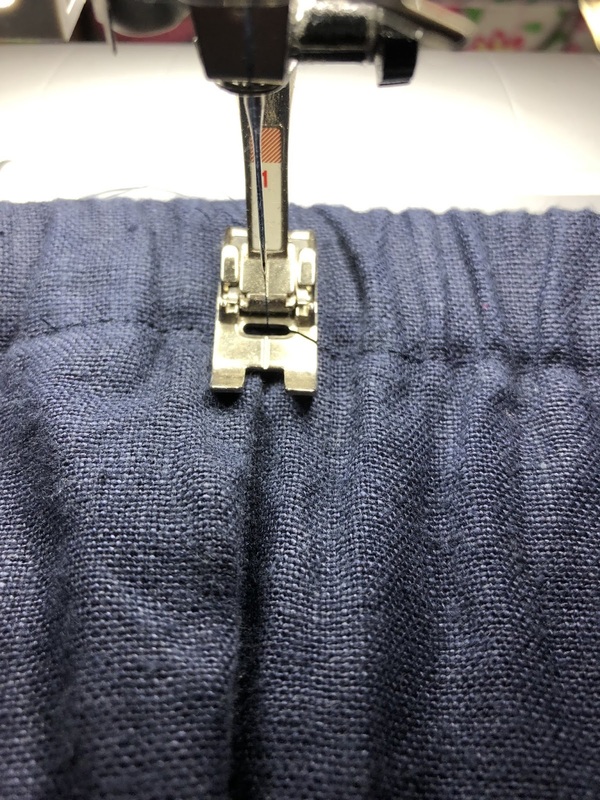 And you can read the tutorial about creating the tucked hem here. I love this technique!!! This precious dress was not created for Easter but it would be perfect!!! Here's the link for more information and more pictures. This dress was fun to make because I pleated the collar fabric together with the dress fabric and left off the sleeves. So fun!!! Here's a sweet little bubble that stitches up super quick! I made this as a baby gift for a family at our church at the time. Here's the link. This bubble is fully lined and stitches up fast! 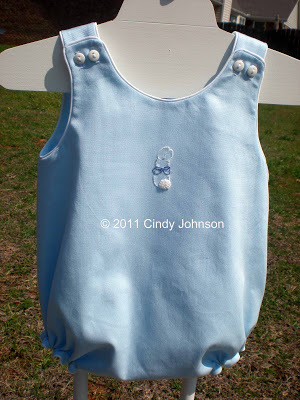 And it could easily be made for a precious little boy or girl depending upon the colors you use. Here's another adorable little boy outfit. Little boys can be hard to sew for...but they don't have to be. 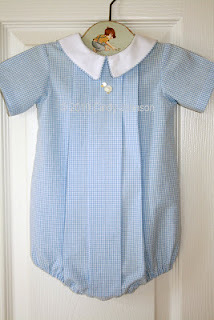 :) I loved sewing for my two boys over the years!!! You can read more about this outfit here and here. Oh my heart!!! Another one of my favorites!! I have so many favorites!!! 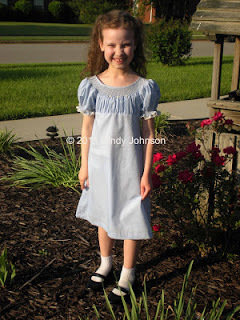 :) I loved this dress as it was great for a little girl who did not want a bishop dress that year. It was so classic and beautiful!!! 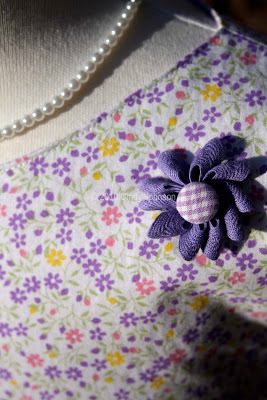 It was made from a Maja's Heirloom pattern called Larkin. You can read about it here and see more pictures. I have plenty more on the blog and I'll dig through some more if I can over the next week or so. 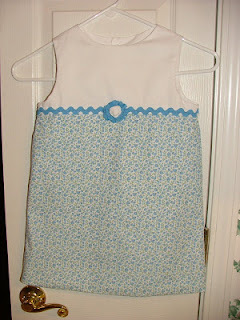 But I'll leave you with this dress for now because it is such a quick and fun sew. This is made from the Children's Corner Lillian pattern. 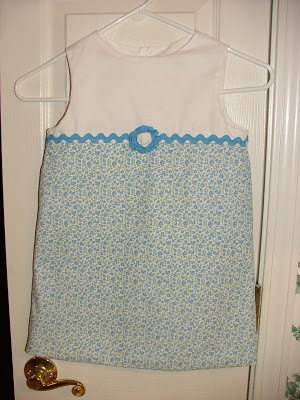 I cannot tell you how many of these dresses I have made over the years. I love this pattern!!! It is fully lined and stitches up fast. Plus it is really a blank slate and you can do SO much with it!!! I love it!! This one has some rick rack around it and a rick rack flower in the center. You can read more about it here and here. I hope you enjoy this flashback of some of the Easter outfits I've stitched over the years. There are plenty more. I will try to highlight some more soon. Until then......Happy Stitching Friends!!! Not too long ago I decided to make a few handkerchiefs as a special gift. I thought I could purchase some nice ones and then add some hand embroidery on them. I had the hardest time finding any that I liked the feel of the fabric. So I ended up making handkerchiefs.....and then I stitched on them. The handkerchiefs were 7" x 7" finished and I used some nice batiste fabric that I already had. I was very pleased with how they turned out. I flipped through various embroidery books that I have to find small design options. And of course, I could have reduced larger images to make them the right size, too. And I used my favorite floss colors again. Sometimes I wonder if I use them so often just because they are easily available - meaning that I use them the most often so they are the easiest to find when I go looking for floss. Speaking of which, I am still using my fabulous and fun sewing pouch that I made many years ago!!! I still love this bag!! 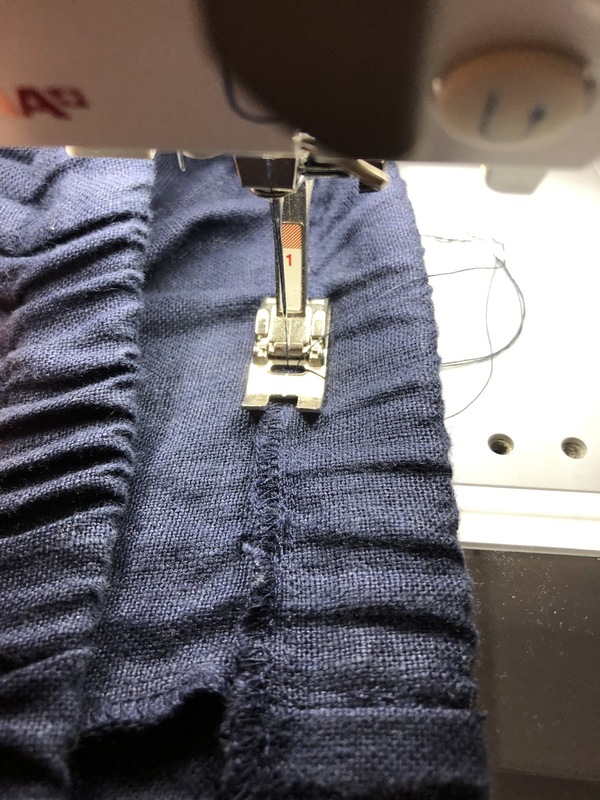 I usually keep a preemie gown in it that I'm working on, so if I am heading out the door I can grab the sewing pouch and have a project to work on if I have to wait while I am out. I love how these handkerchiefs turned out. I need to make a few for myself. I love the idea of a cloth handkerchief. The kids and I have embroidered many handkerchiefs over the years for their Dad. They are a super simple project and a lot of fun!!! 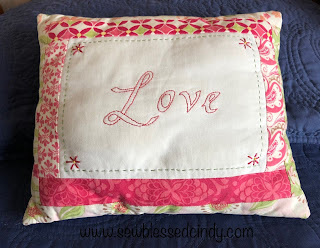 I hope you will consider stitching one for a special friend and/or yourself! P.S., I just remembered that I made another handkerchief years ago that I stitched into a cute little bonnet. So I guess this wasn't the first time I stitched a handkerchief from scratch. And for this one I put precious lace around the edges. I hope you are enjoying the sights and sounds of this Christmas season!!! My favorite is hearing all four of my children playing Christmas songs on the piano!!! Anyway, although I don't have many gifts wrapped and under the tree yet....I do have this sweet smocked ornament on the tree. I made this ornament many years ago and I still love it. 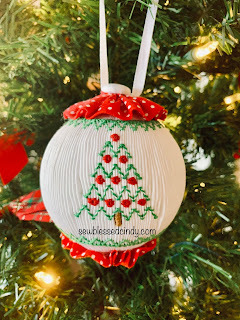 I have basic directions for making the ornament that I shared with my local smocking guild years ago, and I'm happy to share it with you too. Just drop me an email and I will send it to you. I do not have the pattern for the cute little tree though. It was in the Sew Beautiful Holiday 1988 issue. However, I tried to get a close-up picture so you can probably re-create it easily if you'd like. I had a gift card that I needed to somehow package for a friend. I pondered putting the gift card in with their Christmas card but ultimately I decided to stitch a quick gift card holder. I put the gift card down on a piece of blue felt and traced around the card leaving about a quarter of an inch on the two long sides and one short side. I then cut a second piece the same dimensions but about a quarter of an inch shorter. My two pieces were 3 1/2" x 2 3/4" and 3 1/4" x 2 3/4" and should work for any standard-sized gift cards. Before I stitched the two pieces together, I took the slightly smaller piece and hand stitched a triangular piece of green felt onto it. 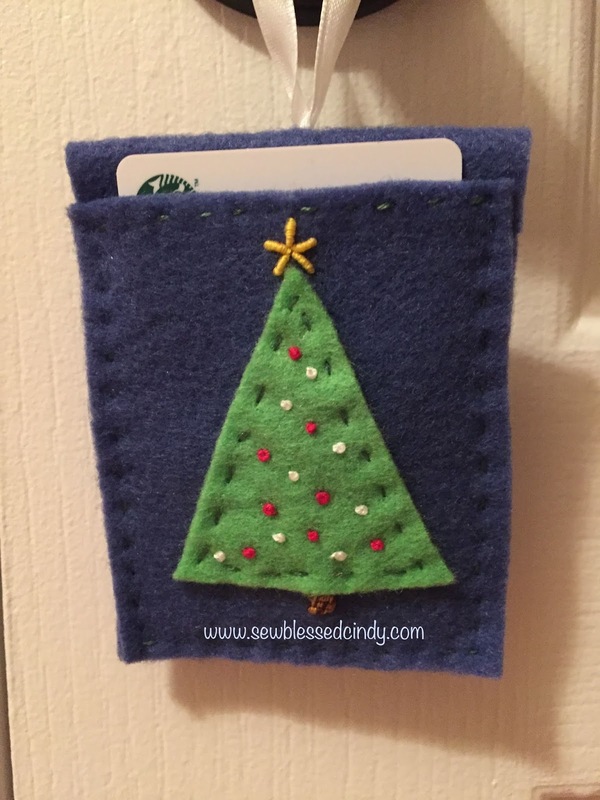 I used green embroidery floss to stitch the tree using a quick running stitch. Then I used red and white floss to create the ornaments making simple french knots. I used brown floss to make the trunk using bullions. And likewise, using yellow floss, I created a five-pointed star on the top using bullions. Next I put the two blue felt pieces together, matching up three sides, and using blue floss ran a quick running stitch around those three sides. And finally, I stitched on a looped white ribbon so the card and holder could be hung on the tree. I'm just thinking that even if you don't have a gift card to package you could put cash in the holder too. I've made several of these over the years but I think this one worked up the fastest and I liked it the most. Stitching for family and friends is so fun this time of year!! I hope you consider stitching one this Christmas! And if you do, I would love to see it!!! This picture has some of my favorite things in it! I love Thanksgiving and taking time to slow down, enjoy time with loved ones, and reflect on the blessings in my life! Do you see the tablecloth in the background? My precious cousin, Leonora who was more like a great aunt than a cousin, crocheted it for me about 30 years ago. She and I shared a mutual love of reading, baking, and crocheting. I'd go to her house and we would stay up super late on Thanksgiving Eve making cakes, pies, etc to share with our family. We started this tradition when I was about 12 years old and continued until I moved away for graduate school when I was in my early 20's. Those are such special memories to me. I made the basket many years ago when I was determined to learn how to weave baskets. I have many baskets now that I have made over the years....but I love the colors in this one. Some precious friends of ours invited us over recently for fellowship and they had all the supplies for us to make these beautiful fall flower arrangements using a real hollowed out pumpkin as the vase. Gorgeous!!! I need to snap another picture of just the arrangement!! 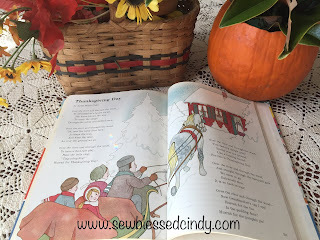 And the Thanksgiving Day poem by Lydia Maria Child....well, it's such a wonderful poem and a tradition. I remember learning this song when I was about 7 years old. It's a favorite for sure!!! 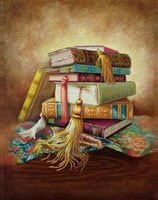 And the book it is in here is from my Childcraft collection. I love these books and had a set when I was growing up. I now have two sets and my little ones love to browse through them as much as I did, and still do. We have already had our big meal for the day. It had all our traditional dishes and it was lovely. Now the kids are stringing Christmas lights outside the front of the house and I'm thinking about working on a stitching project. I have several I'm working on right now - so the problem will be making a decision on which one to work on. I hope your day has included some of your favorite things too!!! From our house to yours, I wish you a wonderful and blessed Thanksgiving Day!!! My girls still prefer to dress modestly and nice skirts can be difficult to find in our local department stores. So the past few years we have had great success shopping at local thrift stores for skirts and dresses. 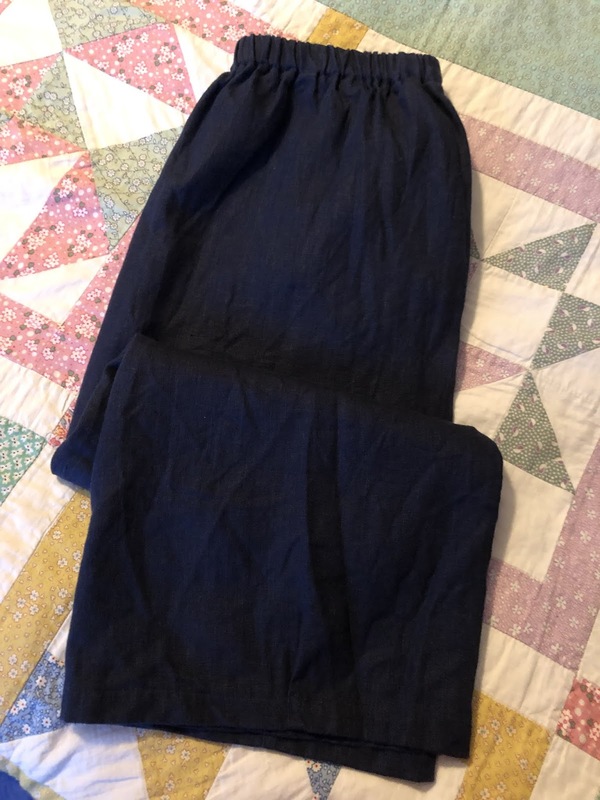 My Elisabeth recently found this navy blue linen skirt shown above. It is beautiful and well-made. 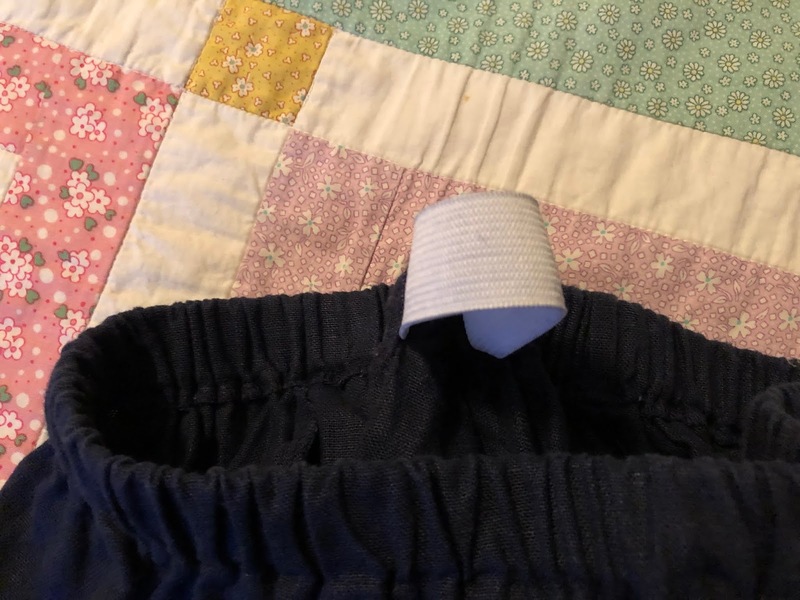 She has washed it and worn it a few times but the waist is a bit tight on her. I told her we could easily correct that issue. This is the beauty of being able to sew and alter items to fit you well. 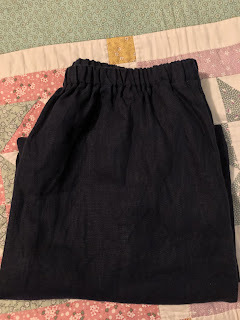 This skirt has an elastic waist, but it is well-made and the elastic is "loose" and not stitched into the skirt. So that makes it really easy to modify. I usually un-pick the casing seam either over the center back seam or a side seam. 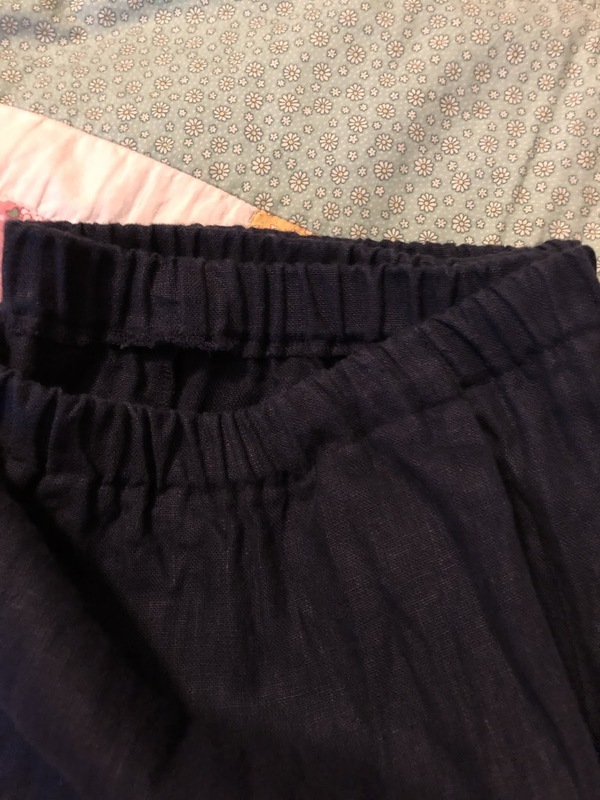 For this skirt I un-picked the seam at the center back. 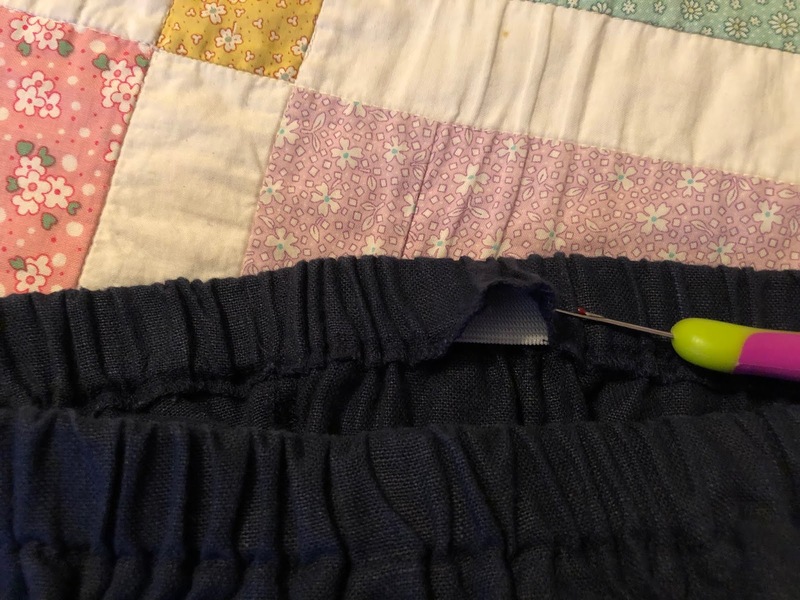 I removed enough stitching until I could easily pull a loop of elastic out. Then I cut the loop. I don't worry about finding the original join....but rather just cut wherever. This elastic can easily be recycled into something else. Or I could just stitch on another piece of elastic to extend this piece if I wanted. 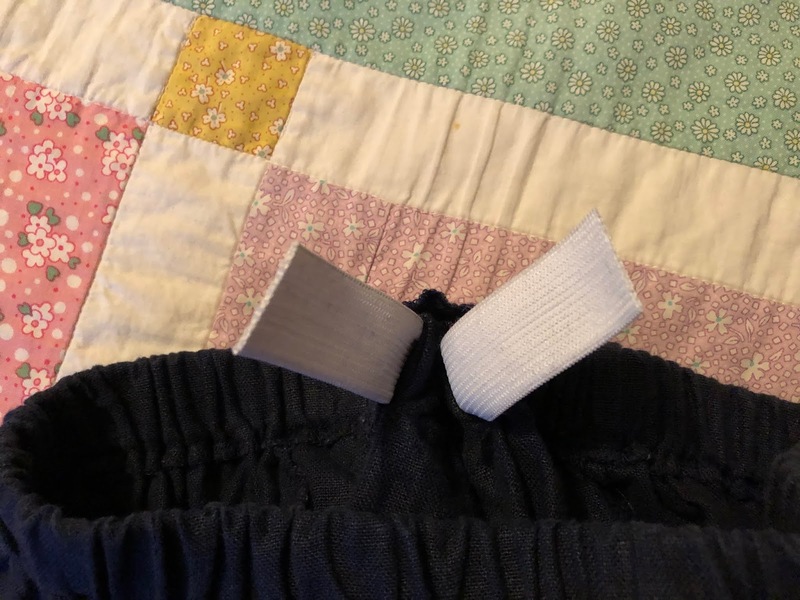 But this time I decided to just add a completely new piece of elastic. 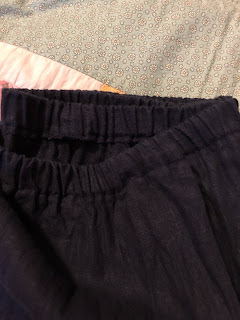 Likewise, if the skirt was too big the same procedure could be done and the original elastic could be cut smaller to fit the waist and re-stitched. Here's the waist casing with the elastic removed. It's kind of hard to see. The elastic on the top is the piece I removed from the skirt. The bottom piece of elastic is the one I'm planning to add back into the casing. 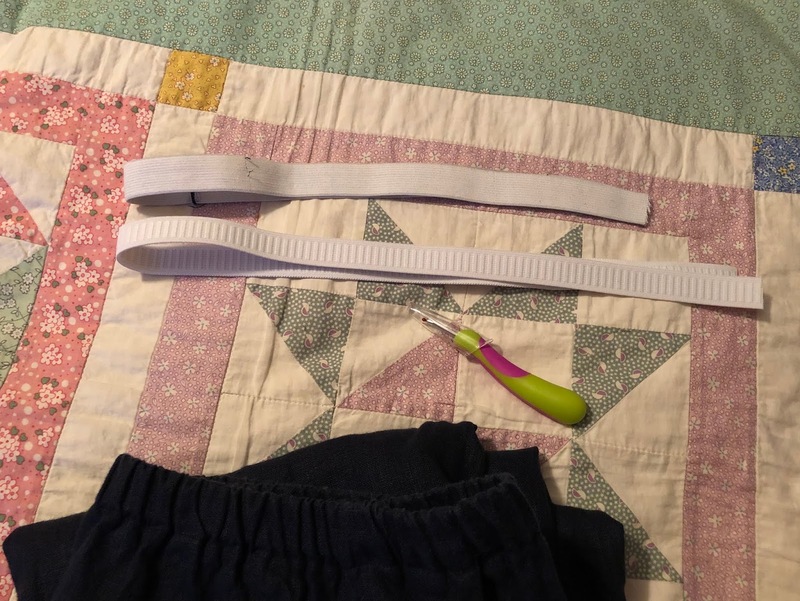 I cut the elastic to the measurement that works better for Elisabeth. After I re-threaded the new elastic into the casing (without getting it twisted) I stitched the elastic by layering one end on top of the other and zigzagging a straight line. Then I re-stitched the casing seam using navy thread and a straight stitch. 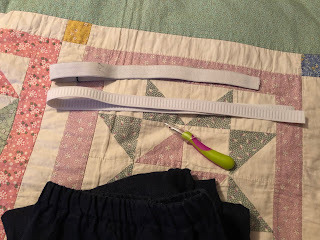 To finish the project I do what I often do on elastic waistbands - I stitched on both side seams (through the elastic) just about an inch to secure the elastic in the band so that it doesn't twist while wearing or during washing. I know this is a dark picture but here is the final result. (I will edit this post when I get a picture of Elisabeth wearing it.) It is a calf-length skirt and has a wonderful shape to it. And I love that it's a nice quality linen fabric. And I forgot to add it has pockets in the side seams - Another bonus!!! This is one quick and easy way to make those wonderful items you find at a local thrift shop work for you. I found this embroidery pattern from the Clementine Pattern Co that I really wanted to stitch. I like all of their patterns but I thought I would start with this simple one. I stitched the letters in a pretty coral colored floss using a backstitch on a piece of cotton fabric and quilt batting. I often put batting behind my embroidery projects because I really like the finished product it yields. I feel like the batting gives it more body than just stitching on a single layer of fabric. 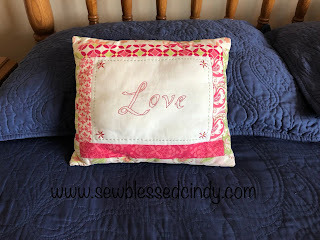 After I finished stitching I couldn't decide what I wanted to do with it, but I knew I really liked it and therefore I wanted to enjoy it daily. Finally, I decided to turn it into a pillow. I had a Moda jelly roll of some gorgeous fabrics that worked perfectly with the floss color I chose. I added the strips to the sides in a log cabin style and embellished it with a little more stitching around the perimeter. The back of the pillow is another coordinating Moda print. I filled it with stuffing and gave it a place of honor on my bed. Now I get to see it everyday and it never fails to make me smile!!! I love it!!! Have you made something lately that makes you smile? 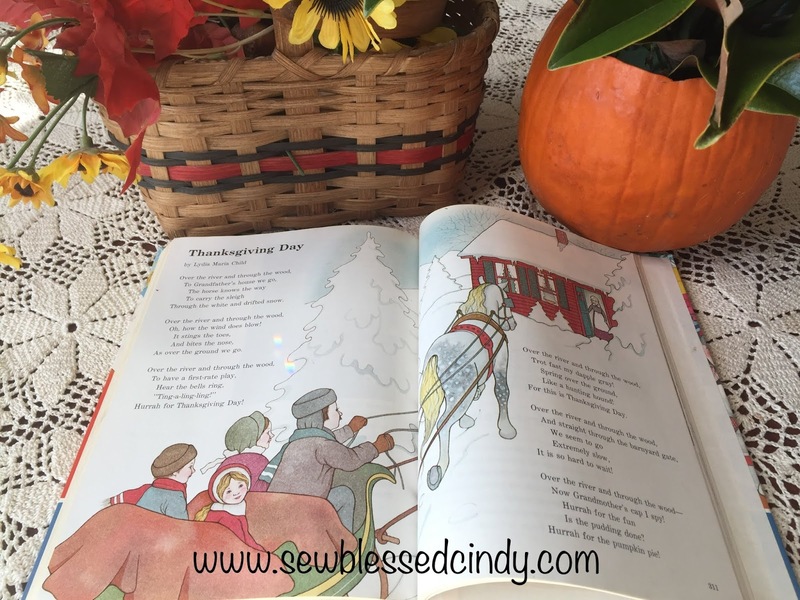 I am a Christian homeschooling mom!! I am blessed and grateful to our Lord!!! I hope to inspire and/or teach others to enjoy sewing. Come join me on FB at Sew Blessed Cindy and/or Instagram at sewblessedcindy! All images, text, and content on this site are the sole property of Cindy Johnson and may not be used, copied, or transmitted in any way. Thank You!